60.7 million people in the U.S. owned smartphones during the three months ending in October, up 14 percent from the preceding three month period, representing 1 out of every 4 mobile subscribers. […] Despite losing share to Android, most smartphone platforms continue to gain subscribers as the smartphone market overall continues to grow. via comScore Reports October 2010 U.S. Mobile Subscriber Market Share – comScore, Inc.
29.7 percent of U.S. mobile subscribers now own smartphones that run full operating systems. The most popular smartphones are the Apple iPhone and RIM Blackberry, which are caught in a statistical dead heat with 27 percent of smartphone market share in the U.S. Twenty-two percent of smartphone owners have devices with the Android operating system. via U.S. Smartphone Battle Heats Up: Which is the “Most Desired” Operating System? | Nielsen Wire. I’ve been tracking the Nielsen data and using it as a basis for forecasting the penetration of smartphones. While most coverage of this data focuses on splits between current OS platforms, I will look at competition with non-consumption and the impact on operator services. 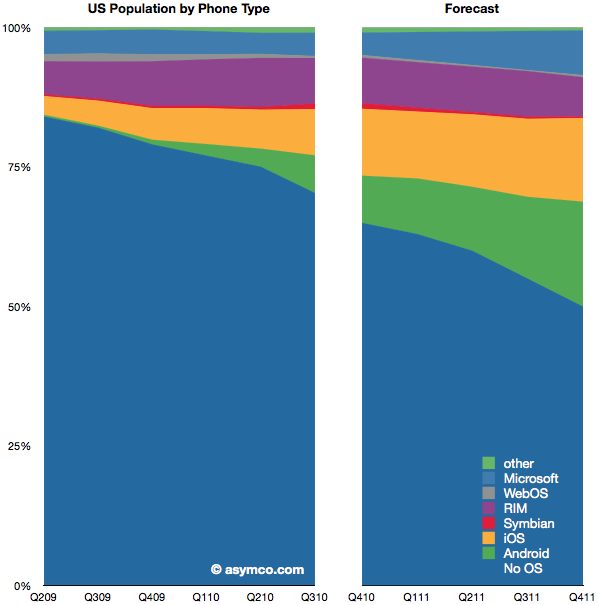 If my forecast is correct, smartphones will make up 50% of all phones in use by the end of 2011. That’s up from nearly 30% today and 18% a year ago. One in three of all phones in use will be either iOS or Android. That adds up to about 80 million users; up from 35 million today. Overall, 120 million Americans will be using smartphones. Now consider the consequences for how services are delivered by operators. The most popular product operators will be selling will be unlimited data plans. One year hence, by 2012, unlimited data plans may become the largest service revenue generator for mobile operators in the US. Pricing and competition will inevitably be in a state of extreme flux. I leave the consequences to the imagination of the reader. Note that the charts show share of phones in use, not phones sold in a particular point in time. In other words, this is measuring platform consumption, not units sold.